Some useful Google Search commands and shortcuts | NewbieTechTips! As everyone knows that Google Search is The biggest internet search engine serving billions of search queries per day. But do you know that Google search has evolved from a basic search engine to a much advanced search application. Now its lot more than a search engine, it’s a netizen's friend. There are a lot of shortcuts and search commands one can use to get information of daily life quickly and easily. Lets see some of such most useful search commands. Google search can be used for currency conversion. 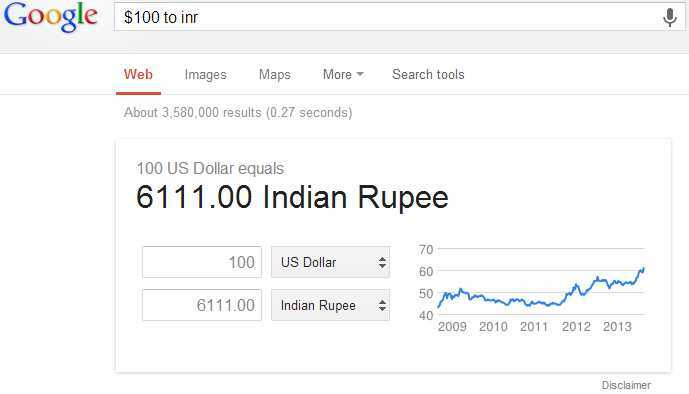 If you are using Indian google version www.google.co.in, just type the amount which u wanna convert to INR and Google will convert it in rupees. 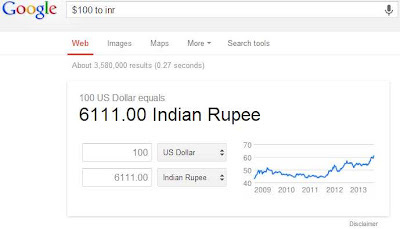 For other versions of google search type 'currency 1 in currency 2' to get the results. Just type like 'unit 1 in unit 2' to get the results. 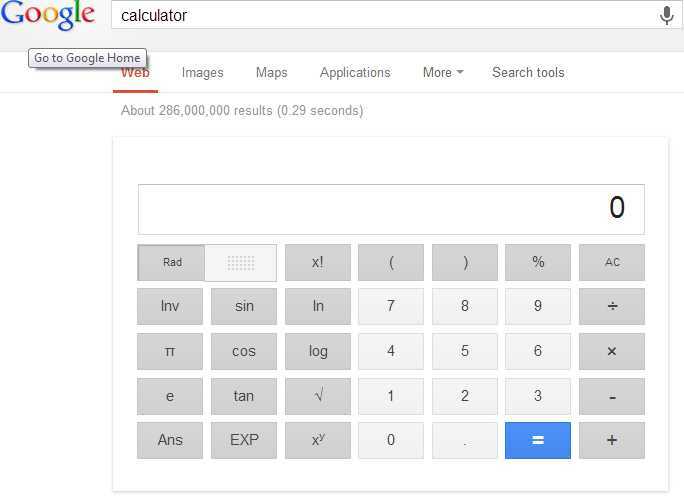 Google seach packs a fully functional calculator in it. 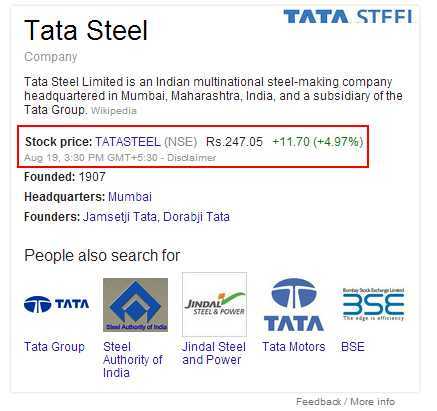 In some situation when there is a website with same name of the stock or the name of the company is same as the name of stock, the info is displayed in the sidebar, along with the information of the company. To see the weather for many U.S. and worldwide cities, type “weather” followed by the city and state, U.S. zip code, or city and country. Zip code search may not work for cities other than US. 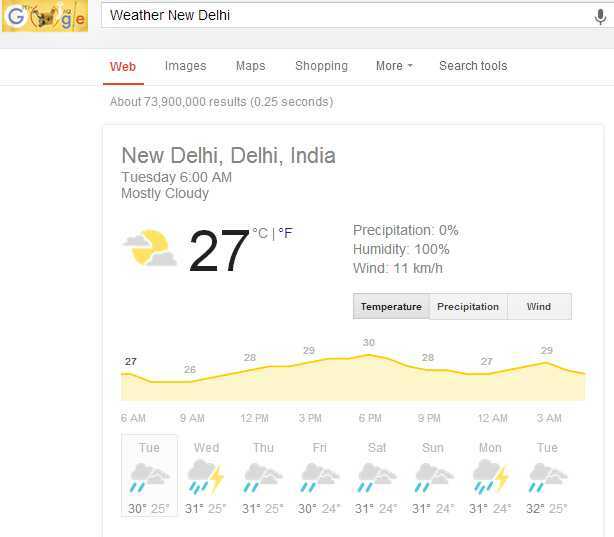 Below is the example of New Delhi Weather. The weather information is shown for a whole week. 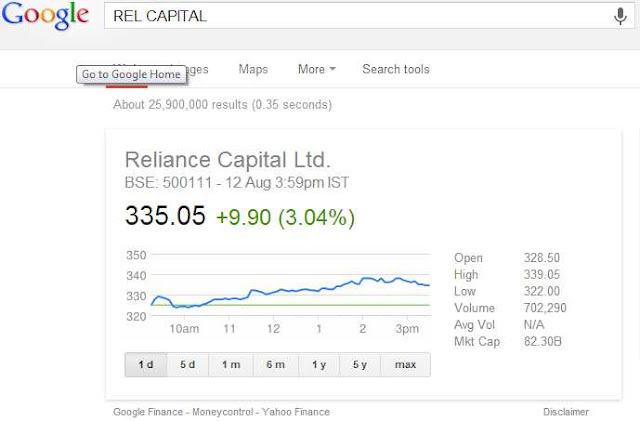 Google search has a nice inbuilt timer in it. Just type 'timer for x hours y min z sec to start the timer. Once the timer is finished, a beeper will blow untill you click on OK.
Other than these useful commands, there are some other shortcuts. Some of the shortcuts may not work for all the countries and cities outside US. To get dictionary definition type 'define (word)' . The definitions are usually picked from reputed online dictionary sources and also Wikipedia. Type 'movies city name' to get the result. This will only give results for most popular cinema halls and multiplexes and may not give results for small cities. 12. Some other Commands which can be used. Type: doughnuts with * Returns doughnuts with sprinkles, etc. genealogy *.edu Returns all educational websites with the term genealogy in it. # Makeuseof.com has made a pdf file of search commands. Which can be downloaded here. If the download does not start automatically. Select the first link. If I have missed any more exciting shortcuts, do post in comments.